Here are some of the strangest games to drop into the App Store this week, and they’re all about playing with fat stacks of cash. Or change. What you do with this information is between you and your iPhone. 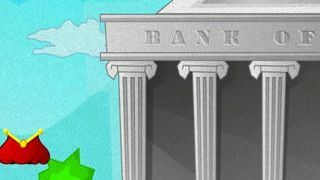 Here’s a pretty simple game about sliding a change purse around to collect money that’s inexplicably falling from the sky outside of a bank. Did the bank explode? Is a crazy person standing on the roof just throwing down cash? And how long is this going to last before someone tackles him? All these questions and more can be yours in Money Rain Fall. It’s tempting to get a little cynical about this paid app and its potentially transparent title, but let’s give the developer the benefit of the doubt. Make Me Money Swipe Money Game has three monetarily themed modes for you to play around with. I’m not clear on what the first one is, but if I had to guess, I’d say that you have to swipe as many dollars as you can before they fall off the screen. So you’re basically like a person in one of those money tubes that radio stations used to drag around to used car lots. Unless they still do that; I honestly don’t know. The second mode is yet another version of Piano Tiles, only the non-white tiles are money, and the third is about swiping to keep a coin in the air while simultaneously grabbing bills for points and prosperity. So, hey. You get some content for your dollar. 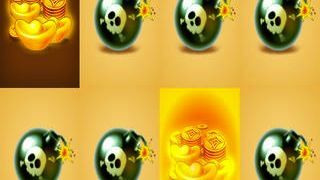 Crazy Money Tap is just a straight-up version of all those tile games, only the good tiles are stacks of gold coins, and the bad ones are bombs with skulls painted on them. So it’s really making a great first impression. And I’m being sincere when I say that. Because you’re right, Crazy Money Tap: Plain tiles are boring. It doesn’t matter if the good ones are the white or the black. Where’s the drama there? Where’s the sense of peril? And what’s in it for me if I tap the correct tile instead of the forbidden one? Points? Stack of gold coins? Yes. Sign me up. I know what my motivation is now. I understand the Doge meme insofar as I know what it is and why it’s funny. I have a little more trouble grasping how it’s lasted this long or captured people’s imaginations to such an extent. It’s probably because of the Shiba Inu. Because Shiba Inus are completely amazing. Anyway, this is Doge Coins. 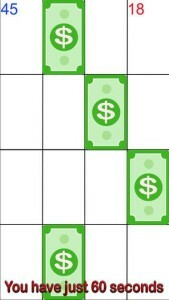 It looks an awful lot like Money Rain Fall because they are the same game. But in this one, a Shiba is holding the coin purse, which means that Doge Coins is automatically more awesome. See, that’s where your dollar goes in this one. Toward awesome. 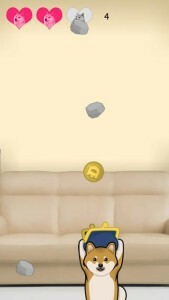 Doge Coins also uses tilt controls instead of touch, but whatever because look at those f***ing ears.